Fidel Castro described Ambassador John Ferch as “very intelligent but dangerous.” “Ferch, tell the American people that I’m serious!” he insisted. The ambassador was given messages to take back to Washington: “Ferch, the Comandante (Fidel) wants you to tell the President that we are revolutionaries not narcotraficantes!” “Mr. Ambassador, you’ve got to stop him (the Honduran president)!” “Scatter my ashes upon the River Plate as a pox forever upon Argentina!” And so run the misconceptions of American diplomatic power depicted in this hilarious, and sometimes serious, recounting of 30 years in the Foreign Service. From Argentina through Latin America and across to the Caribbean, Ambassador Ferch pursued our foreign policy with Latin American society at all levels. Attempted bribery by Dominican politicians, admissions of inconsistencies by Mexican diplomats, evidence of misconstrued machismo, dealing with suspicious indigenous peoples both enlivened his days and warmed his heart. 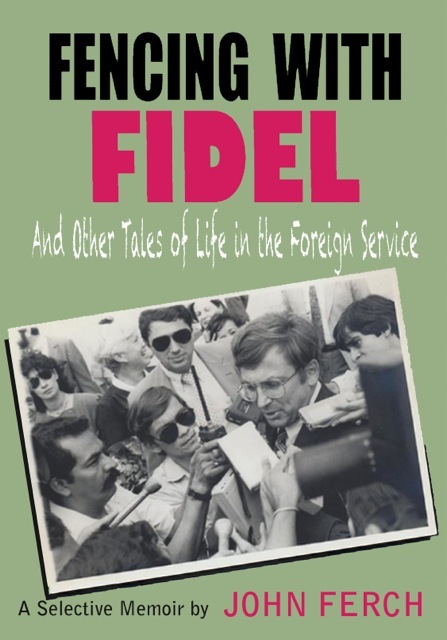 “Fencing with Fidel” is not a typical diplomatic memoir. While he discusses and explains foreign policy, Ferch is more interested in showing the very human aspects of life in the Foreign Service. He demonstrates that it is not a craft that you could learn or practice in his home town of Toledo, Ohio. Both would-be entrants to the craft and those interested in how the Latin and the Yankee actually interact on the ground will find “Fencing with Fidel” enlightening and enjoyable. Ferch uses his career to explore the culture of Latin America and to explain the unusual pressures under which our diplomats work. Most episodes are treated lightly and with humor because he found the Foreign Service rewarding and enjoyable. Some are handled more seriously befitting the policy difficulties he faced. The book also stresses the important and difficult role played by spouses in a Foreign Service career.